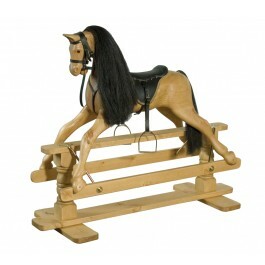 Handcrafted pine wooden rocking horse with a waxed finish. After years of nagging (no pun intended) by my wife, who had always wanted a traditional rocking horse for our children (and now grand-child), I was finally coerced into looking around to see what might be available. It was to be a secret birthday surprise, which complicated the delivery and storage process as well as the research and purchase. Suspicious wife has the endearing habit of invading my web-browsing and e-mailing space - - -.